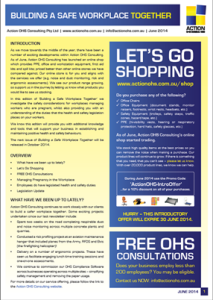 Please find Action OHS Consulting’s June 2014 edition of our 4-monthly newsletter Building a Safe Workplace Together. Along with introducing our online shop, in this edition we have provided an overview of the health and safety duties placed on employees and presented some foreseeable hazards that you should be considering to assess if there is a pregnant employee at your workplace. Additionally, we have included Health and Safety legislation updated.